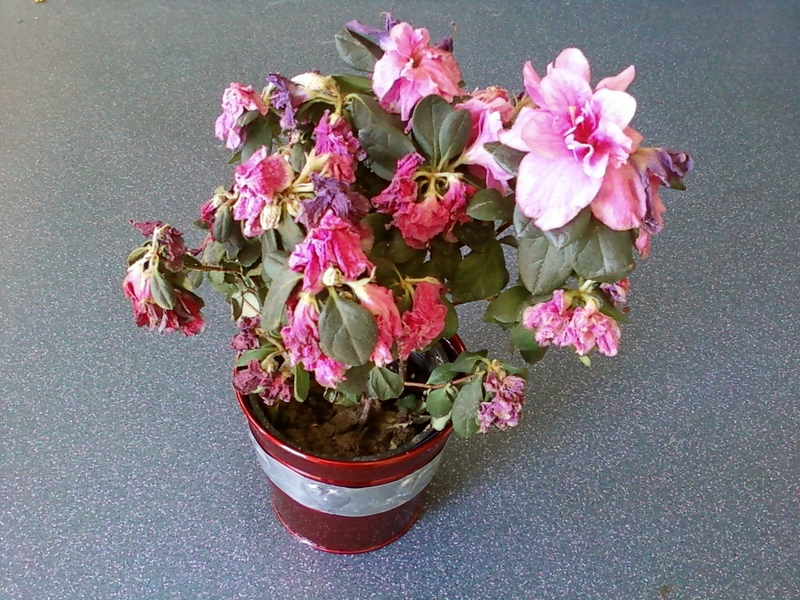 My middle son bought me a beautiful Azalea plant for Valentine’s Day! It is pink, my favorite color. I love it! On Monday, I watered it, or drowned it apparently! But, I didn’t notice until Tuesday when I saw it all droopy! I thought it would recover so I left it alone. On Wednesday I was really worried about it, it was still quite droopy and not seeming to get any better at all! But, the sun was shining beautifully, so I thought I would just set it out side and let the sun dry it out a bit. The soil was till really wet. So, I happily went to work doing the shopping lists for the site on Wednesday, it became more dreary out and then a storm came out of no where and hit hard and fast, and with tons of hail! I watched the hail and the rain, thinking wow that’s a bad storm! The storm went away almost as fast as it came. I kept working. In the afternoon it dawned on me that my poor Azalea was out IN the storm and HAIL! Oh No! I ran and got it , I don’t know why I was hurrying… the rain and hail had stopped hours before. Well, here’s what it looks like today – so I guess this poor drowned Azalea is my Friday Fail!